Dash has soared nearly 40% in the last 7 days from $87.80 on March 26 to a new 4-month high at $121.90, during this morning’s trading session. The explosive rally kicked off shortly after Binance announced new DASH trading pairs on March 27. The addition of BNB and USDT trading pairs greatly increases DASH’s liquidity, and offers investors a new stablecoin option to trade into during a falling market. “Increase[s] scalability through improved consensus…increases the scalability of InstantSend on the network … [and] leverage[s] LLMQs to improve network security by mitigating 51% mining attacks”, respectively. Together, these two bullish catalysts have allowed DASH to break over the psychological $100 mark for the first time since November 2018, and boosted trading volumes by nearly $100 Million. On the 1D DASH/USD chart, we can see that the asset was tracking inside of a reversal pennant pattern for nearly 4 month until the aforementioned updates encouraged bullish traders to break through the resistance at the $94 mark. After closing above the pennant pattern, the price action experienced temporary selling pressure around the $100 level as autobots and short-term traders took profit at the key price point. Renewed bullish support on March 31 helped to carry DASH through the first major resistance zone between $100- $107, and up to a new 4-month high at $113 before correcting. 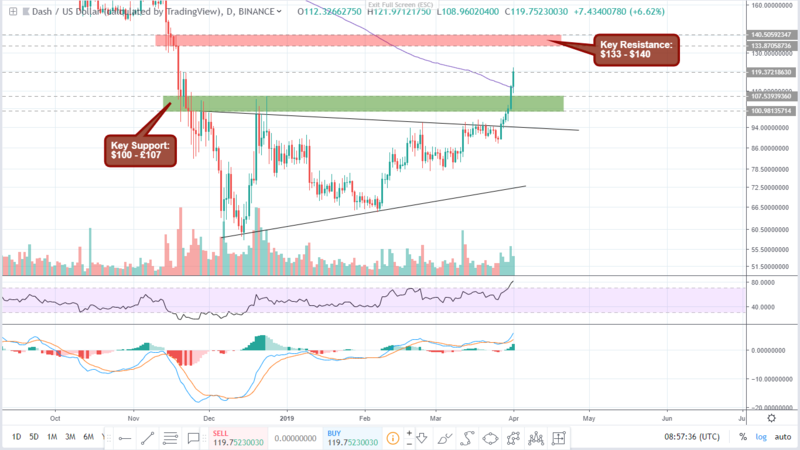 This second surging movement not only pushed DASH into the overbought region on the 1D RSI for the first time since April 2018, but perhaps more significantly, drove DASH over the 200 SMA for the first time in 398 days. This is a very promising signal that bullish momentum has finally returned behind DASH after a devastating performance throughout 2018. Looking at a number of indicators over 2h candles, we can see that the intraday correction after this morning’s pump is almost over, and that bulls are already starting to show signs of a new impulse movement. There are long wicks beneath the last 2 2hr candles as buyers start to overpower the sellers. All ROIs are calculated from the asset’s current value at $116.70.